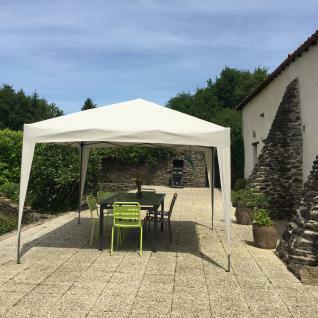 The polyester canvas of this gazebo has a density of 160g/m². It is water repellent and can be attached to the frame with Velcro straps. It can be very easily assembled and dismantled in a few minutes, thanks to its pop up opening system. Fully extend the folding tent by gently spreading the 4 vertical posts, elevating them to the desired height and then locking them in place. No tools necessary. The Tecto has 3 adjustable roof heights. Ropes, pegs and pre-drilled plastic feet are provided with your gazebo so you can fix it to the ground, thus ensuring good stability. A carry bag is included which is ideal storing or transporting your gazebo. This gazebo is delivered pre-assembled so you will only need to unfold it.